Mothbot (or maybe robo-moth?) 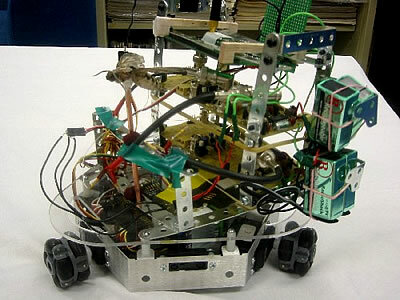 is a small robotic vehicle controlled by the brain of a moth. Charles Higgins, a professor in the Department of Electrical and Computer Engineering at the University of Arizona has created it along with graduate student Timothy Melano. The brain of the machine is provided by a living hawk moth, the adult version of the horned tobacco caterpillar. It is a relatively large and rugged moth, with a wingspan of about 3 1/2 inches. It lives for several weeks. The moth is immobilized in a plastic tube; it is connected to the "robotic electrophysiology instrument" with tiny wires implanted in its rice grain-sized brain. When the moth moves its eyes to the right, the robot vehicle turns in that direction. One long-term goal of these experiments is to utilize the incredibly sensitive receptors in the moth; a hawk moth costs about $4, whereas state-of-the-art artificial sensors cost orders of magnitude more and are far less sensitive. The challenge with performing these experiments under natural conditions is that conventional electrophysiology equipment is too bulky to be placed on a freely behaving animal. To solve this problem, we have designed a robotic electrophysiology instrument whose velocity is determined by bioelectrical signals from an animal, in our case the hawk moths and flies (model organisms for visual motion detection, olfaction, and insect flight). This robotic instrument allows us to perform electrophysiological experiments while a moth is onboard and controlling the robot, which, in engineering terms, closes the loop. With this instrument we will characterize visual motion detection neurons and investigate the use of these neurons as biosensors for robots. 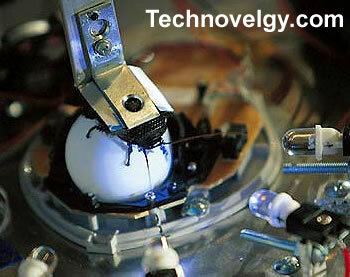 Technovelgy readers may also be familiar with a similar device, the cockroach-controlled mobile robot created by Garnet Hertz. Read more about the Cockroach-Controlled Mobile Robot, which provides a comparable device for a Madagascar hissing cockroach; see also Inscentinel Honeybees Sniff For Explosives to learn how bees are used as biosensors in a commercial device. Read this news article - Robo-moth melds insect, machine - or take a look at Insect Robot Interfacing from Professor Higgins' laboratory website.